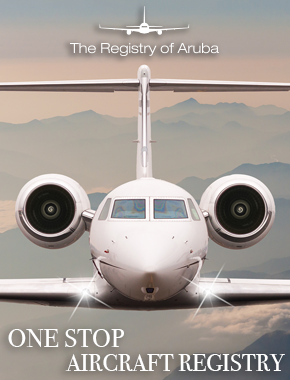 He no doubt released the song, knowing that 20 years later – on November 28 – Miami would be welcoming almost 300 business aviation leaders for Corporate Jet Investor Miami 2017. A full house for CJI Miami 2017. Picture by Javier Galeano. Members of the panel in the current session on selling aircraft in 2018 say the industry has benefitted from the “Trump bump”. Mike McCracken of Hawkeye attributed it to the fact that the US president has a corporate jet himself and hasn’t been “badmouthing” people who travel on corporate jets. Rene Banglesdorf of Charlie Bravo Aviation said there had been a “positive” effect, although she wasn’t sure if it will be sustainable. Don Dwyer of Guardian Jet said he had “definitely seen an improvement in the business” after years of building aircraft getting harder and harder. “People are buying more airplanes than they ever have, but it’s hard for me to give credit for that to Trump,” he said. The panel have revealed the most exciting prospect for the future. Mike McCracken identified the mid-sized market, while Rene Banglesdorf says it’s the emergence of first-time buyers. Janine Iannarelli says speed, and the prospect of supersonic business aircraft, and the fact that it’s “cool to fly again”. Don Dwyer says it’s stable residual values, “which have got to be great for all of us”. Aviation recruiter Craig Picken says it’s “a crime” that young people in the US can’t get financial help to train as pilots. He’s called for European-style apprenticeships to help tackle shortages of pilots and mechanics within business aviation. 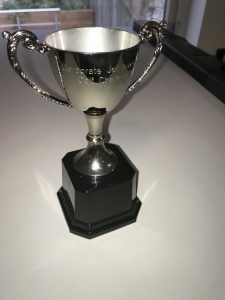 Just when you thought things couldn’t get any more exciting, I can now reveal the winners of the inaugural CJI golf challenge cup and the social media competition. Richard Thomas of Stellar, Brian Flynn of Stellar, and Paul Mulko of FlyEasy have triumphantly carried off the golf cup. They each get to have the trophy for four months of the coming year, before bringing it back to Miami for the 2018 CJI conference and golf tournament. Shaan Bhanji, of FlyEasy, has tweeted and texted his way to glory as the winner of the competition to find the most active user of the CJI Miami app. He wins a Bombardier G6000 model. 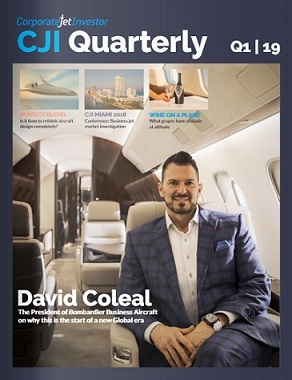 jetAVIVA CEO Cyrus Sigari predicts a product war in the light jet/turbo jet market segment between the Cessna Denali and the PC-12. “That’s good for the customer,” he says. Paul Touw of Stellar Labs says that, if business aviation solves the manual problems that people have booking flights – similar to the issues the taxi sector had before Uber – and goes online, it could triple in size. Collins says he doesn’t think customers trust or understand charter companies. “The alignment between digital and the trusted approach of the human touch – that really gets it done. I think the digital broker would be the optimal setting. Touw said a good way to attract a consumer base for private jet flights would be to put details and allow people to book on online travel agents such as Kayak and Google Flights. Sixty seven percent answered “yes” to the question: “Do you think we should have a standardised aircraft sales contract?”, with the other 33% answering “no”. A panel session in full flow. Picture by Javier Galeano. Delegates take part in one of the polls. Picture by Javier Galeano. Delegates enjoy some al fresco refreshments. Picture by Javier Galeano. Just over half of attendees at CJI Miami 2017 feel more optimistic about the future of business aviation after hearing analyst Jon Raviv talk about the sector’s lost decade. In a poll, 57% said they felt more optimistic about the next ten years. Forty three percent said they didn’t. Raviv, senior equity analyst, US aerospace and defence, at Citigroup, provided data about business aviation’s “lost decade” from research published earlier this year. 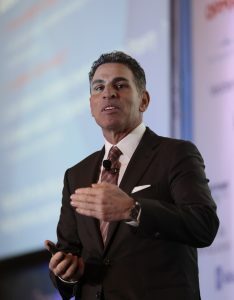 Entitled “Making bizjets great again”, Raviv’s session looked at whether business aviation had escaped the lost decade. He said business aviation had suffered from excess production during the 2000s. In 2010, the industry had expected a recovery that didn’t come. According to his research, there had been expected demand for small and mid-size aircraft (SMIDs) aircraft during the 2000s of 3,930 aircraft and an actual delivery of 5,942 aircraft, leading to oversupply of 2,012. “The industry was oversupplied during the 2000s. We should burn that off by 2020, so we’re almost out of the woods for SMIDs,” he said. He painted a less optimistic picture for large-cabin aircraft – there was an excess of aircraft during the 2000s that didn’t have an impact during the 2010s, but the segment faces a possible lost decade in the future. Demand for large-cabin aircraft during the 2000s was estimated at 1,404 and actual deliveries of 1,898, causing oversupply of 494 aircraft. There was estimated demand for large-cabin aircraft during the 2010s of 2,345 and 1,812 aircraft were actually delivered between 2010 and 2016, causing oversupply of 533 aircraft. “The easiest way to escape the lost decade is new products, and time – time passes and we get back to better demand and supply dynamics,” said Raviv, adding that a lot of SMID capacity had come out of the market, leaving it “pretty steady and stable”. That’s the message to the business aviation sector from financier Dave Labrozzi, speaking during a session on financing. Asked by session moderator Eddie Gross, of Vedder Price, where he saw the financing providers getting into trouble in the future, he said: “My message to the community is very simple. If it seems too good to be true… right? He added that a problem he foresaw was banks entering the aviation financing market, “loading up like there’s no tomorrow”, doing a number of aircraft deals and then suddenly stopping. Kirsten Bartok Touw, of AirFinance, identified loan to value and amortisation as possible problems. “You’ll get into trouble if they’re not aggressive enough,” she said. 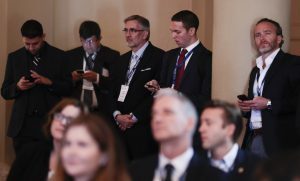 A poll of the audience run during the session revealed that 57% of members thought there was enough finance available, and 43% thought there wasn’t enough finance out there. 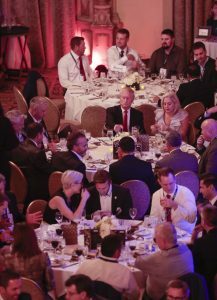 CJI Miami 2017 attendees enjoy last night’s Dealmakers Dinner. Picture by Javier Galeano. Kirsten Bartok Touw, of AirFinance, says it’s very hard to get loans to buy aircraft outside the US, and this needs to change. She said a lot of banks outside the US don’t have the skills in aircraft finance needed to do these transactions. Al Whyte of Corporate Jet Investor is introducing today’s agenda. “We had a brilliant day yesterday, phenomenal content, brilliant speakers. Today will be the same,” he said. Welcome to day two of CJI Miami 2017. 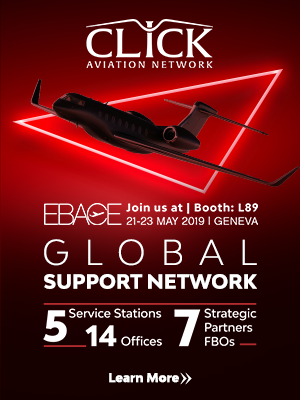 We have a packed agenda, with a range of speakers addressing topics including connectivity, finding new fliers, transparency and selling aircraft in 2018. We’ll keep you updated on the sessions during the day. In possibly the most controversial session of the conference so far, Brian Proctor of Mente Group called for a code of ethics for the business aviation industry and for brokers to be accredited, to stop customers being mislead when buying an aircraft. And he struck a chord with the audience – 86% agreed with him that brokers should be accredited, and one member thanked him for “shining a light on our dirty little secret”. In a session focusing on improving the ownership experience, Proctor highlighted action that should be taken both by customers and by the business aviation industry. For example, he urged customers to make sure they planned their purchase thoroughly, including understanding their mission profile, to “always, always” have a pre-purchase inspection done, and to be aware of any pending maintenance. He said that the business aviation industry needed to stop thinking that people bought aircraft because they were aircraft and to think instead about what people bought aircraft for – “to improve their lifestyle or their business or their relationship with their kids. Customers were confused by brokers who tried to persuade them that they could afford an aircraft that they couldn’t by using “fuzzy maths”, and that “pricing conundrums” such as significant bid-ask spreads and pricing guides that were behind the market also contributed to a poor owner experience. He suggested that the industry get together to support customers by creating a team that would work in their best interests. The team would comprise a reputable broker, legal counsel, a technical consultant, a finance advisor/banker, and a field operations team. CJI Miami 2017 speaker Joseph Zulueta has warned that aircraft owners who delay installing ADS-B Out until next year risk opening “a great big can of worms”. Zulueta, of Aeronautical Systems, says they face the risk of not being able to get a slot and then running out of time to meet the 31 December 2019 deadline, meaning their aircraft will be grounded on 1 January 2020 until they can upgrade them. In a session about the effects of NextGen, FANS and other upgrades on the fleet, Zulueta and Aaron Hilkeman of Duncan Aviation highlighted the number of aircraft that are not being upgraded by owners who are deferring the work for as long as possible. “There are still many, many customers who are deferring it,” said Hilkeman. According to figures he showed, 212 business jets a month are having ADS-B Out installed. However, to ensure that the US fleet meets the deadline, 351 aircraft a month have to be upgraded. The current upgrade rate means that 3,476 aircraft will be unable to fly on 1 January 2020. Delegates have come down firmly in favour of the sharing economy, with 91% seeing it as a real trend, and just 9% dismissing it as hype. Kenny Dichter has told CJI Miami attendees that his company, Wheels Up, aims to have 10,000 members and to be a billion dollar business by 2020. It is also looking at establishing a flight desk and a second tier of membership for people who fly fewer than 15 hours a year. Dichter reiterated Wheels Up’s commitment to expanding into the European market. “We want to be in Europe. In two hours in a King Air, you get everywhere. As soon as we figure out this opportunity in the US, we will go to Europe, maybe in a joint venture. Embraer’s Michael Amalfitano brought his crystal ball to CJI Miami, to give delegates a glimpse of the future of business aviation. In his session looking at the key trends shaping the market, he said business aviation had been changing during the last few decades, since charter companies started to emerge in the 1960s to today’s shift from owning aircraft to accessing flights and the disruptive effects of technology. “We believe there’s a new platform – a new ecosystem – out there. What is that platform? It’s no longer about the plane. It’s no longer about owning the plane. It’s very much about how you want to create an experience for the passenger, to have the experience of corporate flight,” he said. This is happening, according to Amalfitano, because Millennials – business aviation’s future customers – have a very different approach to how they buy and use things to previous generations. They use “the device in their palm” to buy everything they need and then share it with everyone they know. Along with the technology has come information – people want increased personalisation and to receive a higher level of service for their investment. Four new types of consumers have been identified by researchers – global executives, cosmopolitan consumers, active seniors, and global clans – who will all fly for different reasons. Amalfitano also listed seven technologies that will have a big impact on business aviation in the future: augmented virtual reality, artificial intelligence, digital integration, big data, 3D printing, driverless transportation, and unmanned vehicles. “There’s an exciting, disruptive horizon ahead of us,” he predicted. 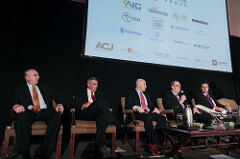 Panellists Don Haloburdo, of Jet Aviation, Marc Drobny, of EJM, Fabian Bello, of Journey Aviation, and Thomas Connelly, of Gama Aviation Group, talked to Ford von Weise, of Citi Private Bank, about the current state of the aircraft management market, and whether there’s a pilot shortage. All of them agreed that the market is strong. Haloburdo said: “We see a lot of people entering the market who might not otherwise get into the management side. They may be first-time owners or exiting a fractional management situation and want a turn-key solution. Drobny said he was seeing a lot of change among aircraft owners themselves. Increasing regulation and technological advances were making aircraft management and operation more difficult and complex. An increasingly complex regulatory environment, that required business aircraft to be properly managed, was good news for aircraft management companies. Von Weise asked them what kept them awake at night. 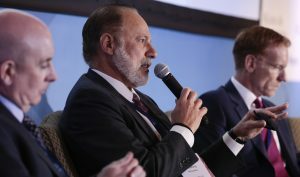 Big potential economic disruptions were Haloburdo’s biggest concern while, for Drobny, it was a mixture of things that would be “hugely impactful” on the industry and tactical issues such as connectivity. Bello said the “unknown” was the greatest threat. All the panellists also agreed that a shortage of properly qualified, experienced pilots was a “huge issue” for business aviation. Pilots who were able to fly a wide-bodied corporate jet anywhere in the world, and were willing to be on call 24/7, had to be offered “something substantial” to entice them away from jobs they were happy with. That could lead to pilots being paid more than bankers, said the panel, and owners being put off by enormous staff costs. A poll of the audience revealed that 62% thought that pilots should be paid more than bankers, with 38% disagreeing. The pre-owned market is growing across the business aviation sector, including business jetliners. Drew Gough, of Boeing Business Jets, is explaining how people who may not be able to afford a new jetliner – which cost in the region of $85 million to $105 million – are snapping up pre-owned aircraft thanks to a range of features including low depreciation and the amount of extra space and baggage capacity they offer. Gough says pre-owned business jetliners cost $19.5 million, at the lower end, up to $72 million, at the higher end. Attendees are split down the middle on the question of whether this is the end of the downturn. Fifty six percent think it is, and 44% think it isn’t. Delegates engaging with the first morning at CJI Miami. Picture by Javier Galeano. Dean Roberts, of Rolls-Royce North America, is highlighting some current trends within the US business aviation industry. “There are some signals out there that are good,” he says. On the same panel, Chris Miller of Shearwater Aero Capital is focusing on depreciation – “the new normal”. The business aviation industry is acting like a mature industry such as car manufacturing, and the data is showing aircraft depreciating by 10% a year. Fellow panellist Anthony Kioussis, of Asset Insight, says higher quality aircraft are “actively” selling, leaving aircraft in poorer condition on the market. As a result, the quality of aircraft available for sale is declining and their maintenance exposure is increasing. “When a broker tells you to keep your aircraft in really good shape, you can see it [in the data]. I fully expect the quality of aircraft on the market to remain low and possibly get lower during the year,” he says. In response to audience questions, Kioussis predicts that new aircraft will continue to be produced and will put pressure on values. Roberts says there’s a “smell of innovation” in the industry that could have a positive effect on demand in the long term, such as new people entering the sector – “the millionaire next door being able to have access to a business jet”. Kenn Ricci (pictured) says respecting the balance sheet is one of Directional Aviation Capital’s fundamental investing principles. A lot of industries – including aviation – are dealing with collapsing balance sheets. “People always look at growth – how to generate cash flow – but respect for the balance sheet is becoming more important today,” he said. The next principle, focusing on return on invested capital, was the way to deal with “an environment of collapsing balance sheets”. The other two principles are operating cash flow not EBITDA, and that purchase terms are as important as valuation. Kanye West couldn’t have described CJI Miami 2017 any better if he’d tried. 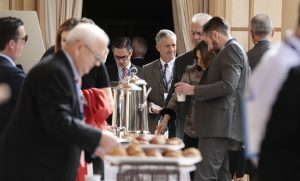 The good life for delegates starts today, with a breakfast sponsored by Bombardier to fortify them ready for a packed day of sessions, rounded off with a cocktail reception sponsored by AIC Title Service and the Dealmakers Dinner sponsored by Mente Group and ViaSat. First up is Al Whyte, co-founder and editor of CJI, with a few well-chosen words of welcome. Then Kenn Ricci, chairman of Directional Aviation Capital, will talk about investing in business aviation. 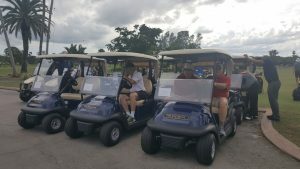 CJI Miami 2017 has got underway with a group of attendees teeing off at the Biltmore Hotel’s golf course for the nine-hole CJI Challenge. The weather’s cloudy and a bit overcast, but still warm, so our golfers should soon get into the swing of things. We’ll update you later this afternoon on who scoops the rather attractive trophy. In the meantime, here are some of the players at the beginning of the day’s play. 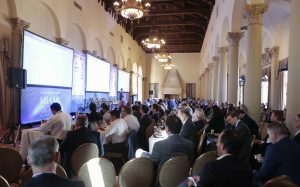 On the eve of CJI Miami 2017, event sponsor Global Jet Capital has predicted that around 30 mid-size jets will be delivered to Florida customers between now and 2025. The value of the deliveries is expected to hit $1.5 billion per year, $250 million of this is thought to be purchased through operating leases. Global Jet Capital are primed to benefit from this, expecting the demand for jet financing in Florida to increase significantly over the coming years. Dave Labrozzi, CEO of Global Jet Capital will be speaking at CJI Maimi on Wednesday on the business jet finance panel Money, Money, Money. One of the big advantages of business aircraft is you get to set your own schedule. If you own a business jet you never miss a flight. Unfortunately, Alasdair Whyte who is chairing the conference has somehow managed to do this (to be fair, crashes on the M25 ring road around London meant that his trip took two hours longer than normal). The good news is that Virgin Atlantic fly twice daily from London. So he should be there for Kenn Ricci’s opening session tomorrow. The first day is focused on networking. At 14.00 a group of golfers will be competing over nine holes at The Biltmore Course for the CJI Trophy (below). Golf is followed by the JSSI Cocktail Reception at 18.30 on the Central Terrace. We will keep you up to date with the golf as it kicks-off teas-off tees-off (we are not golf experts). 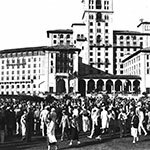 During the 1920 the Biltmore Hotel was one of the hottest places in America. The same is true next week. Biltmore guests 1927: Ginger Rogers, performer; Judy Garland, performer; Bing Crosby, crooner; President Franklin D. Roosevelt, politician; Al Capone, entrepreneur; Johnny Weissmuller, actor most famous for Tarzan (he was also a Biltmore swimming instructor and broke the world record in the Biltmore pool). Is now the time to invest in business aviation? Will we see operator consolidation? Will NextGen, FANS and other upgrades reshape the fleet? Are membership programmes bringing new people in? Should aircraft sales be regulated? Is this the start of the recovery? We will try and give you some of the answers from the stage on Tuesday. 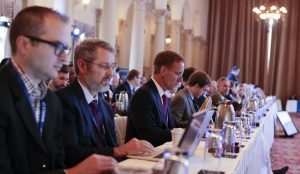 The formal conference starts on Tuesday November 27 and we will be live blogging from the start. If you are attending CJI Miami we really recommend that you download the event app please email louisa@corporatejetinvestor.com for more information. If you want to see photos of last year’s event please click here.